They’re enraged at American complicity in the Haitian government’s blatant effort to rig the presidential election. In 2008, Haitians were ecstatic over Barack Obama’s victory. I remember a group of mature, normally realistic men happily insisting to each other that Obama’s win a few weeks earlier explained why the price of cooking gas had just dropped. No longer. 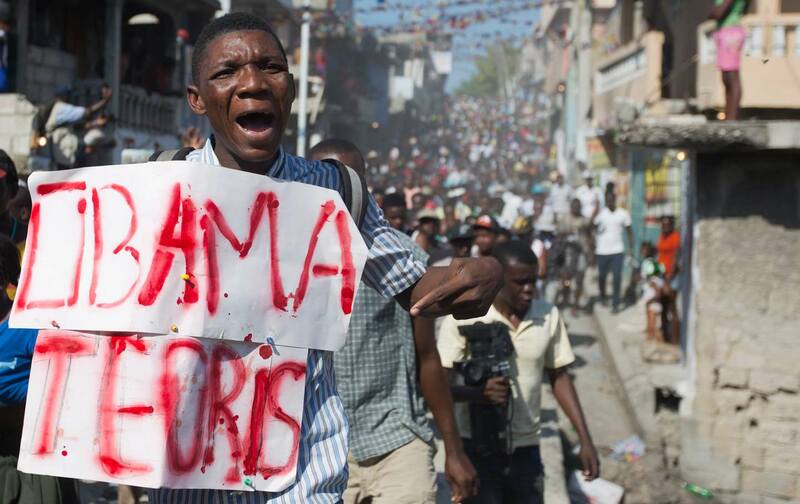 Over the past week, tens of thousands of angry demonstrators regularly chanted “Down with Obama” and carried “Obama Terrorist” banners as they marched through the streets, protesting American complicity in the Haitian government’s blatant effort to rig the presidential election. The pro-democracy movement just won a major victory, forcing the election commission to postpone the second round of presidential voting, which had been scheduled for January 24. (The demonstrators then increased their demand, and are now calling on President Michel Martelly to resign even before his term is up on February 7.) 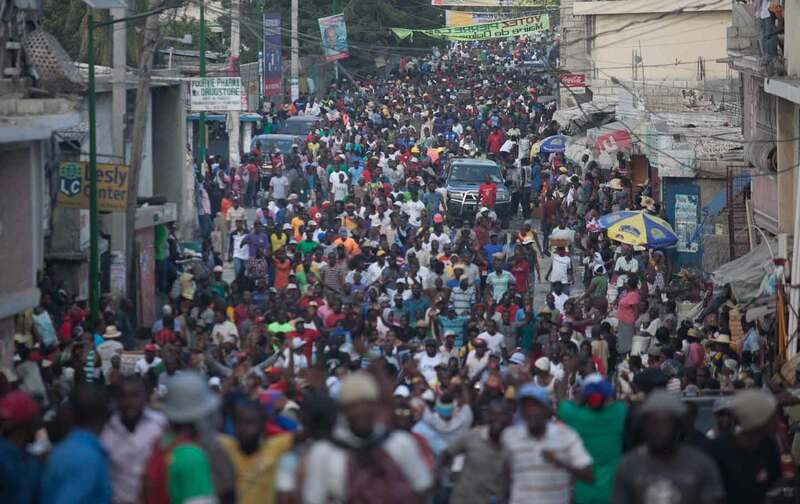 The government backed down after days of intense street protests, a promised boycott, and repudiation by broad sectors of Haitian society, including the opposition candidate who was supposed to participate in the runoff. The cancellation is a huge setback for the United States, which spent $33 million on the election and had been pressing Haitians to go out and vote. Some mainstream press accounts have described the situation here as “chaos,” an interpretation that is completely wrong. In fact, the Martelly government had put together a well-organized conspiracy to steal the election. Martelly, who is prevented by term limits from running again, was trying to impose his successor, and the US State Department abetted him by ignoring the overwhelming evidence of massive vote fraud. One international newspaper described the tens of thousands of pro-democracy protesters as a “mob,” which is also mistaken, and insulting. The demonstrators planned carefully, ratcheting up the pressure in the streets step by step. After the first round of voting, on October 25, the election commission announced with a straight face that the government’s candidate, Jovenel Moïse, had come in first with 32.81 percent of the vote. Moïse almost certainly got less than 10 percent, and widespread ballot stuffing was verified by the respected National Human Rights Defense Network and other local groups. The first protests were peaceful, but no one paid attention. Martelly pushed ahead toward the runoff round. American ambassador Peter Mulrean said he had seen “no evidence of massive electoral fraud,” and he implicitly urged Haitians to swallow the results. The international media totally ignored the rising pro-democracy movement, even though it included supporters from nearly all the opposition parties and from Haiti’s leading human-rights organizations. So the pro-democracy protesters increased the pressure. 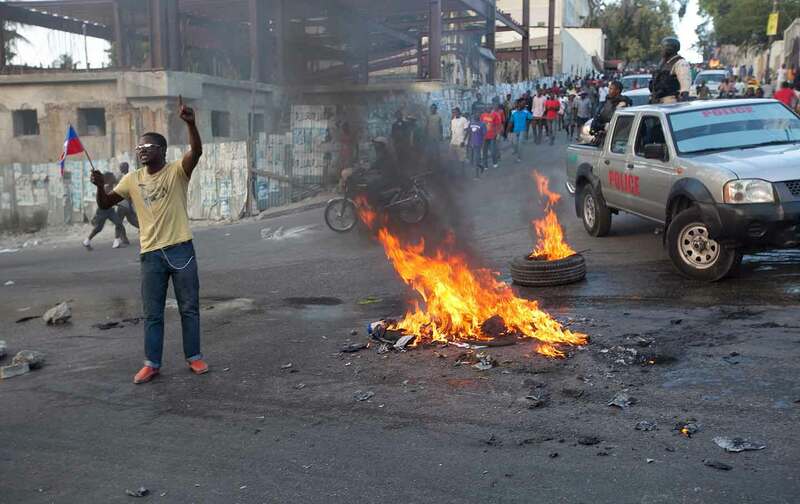 During the marches last week, some of them burned tires in central intersections and started torching vehicles, bringing downtown Port-au-Prince to a standstill. A creative band of protesters at the northern resort enclave of Labadee prevented a Royal Caribbean cruise ship from landing its thousands of tourists. And as images of smoke billowing over this capital started to circulate widely, the rest of the world finally started to notice. Groups of marchers then started converging, attracting more support, and moving rapidly through the Bel Aire and Delmas neighborhoods before winding back down toward the Parliament building. People waving Haitian flags chanted: “We are rebels. We will not obey.” A sound truck playing anti-government songs blasted away. The atmosphere was somehow both festive and enraged at the same time. The demonstrators saluted the mostly sympathetic bystanders warmly—and then chanted “Shoot Martelly” and “Down with Obama,” sometimes adding “Burn Opont” (the discredited head of the election commission). Several key words came up frequently during the animated conversations among the rapidly moving protesters. Magouy means “scheming,” the government’s vote-stealing maneuvers. Ingerans is “interference,” the efforts by the United States and other foreign powers to promote President Martelly’s plot. A major source of anger is huge government corruption. Haitians know that billions of dollars in aid was pledged after the killer earthquake six years ago, but they see little evidence of it. The main downtown street, Boulevard Jean-Jacques Dessalines, looks like a tropical version of Berlin in 1945—empty shells of gutted buildings, and sidewalks choked with street vendors struggling to scratch out a living. People speculate who among President Martelly and his entourage have used which ministries to steal and buy houses they could never otherwise afford. I reported that a mysterious new $10 “tourist fee” had appeared at the airport since my last visit, and the amateur forensic accountants immediately discussed who was dividing it up. Millions of Haitians survive from money wired home by relatives who work in the United States and Canada, and my longtime friend Milfort Bruno says that the government takes a cut. “Every wire transfer has a $1.50 tax,” explained Bruno, who is the proprietor of the Mahogany Craft Shop, across the street from the legendary Oloffson Hotel. “People say Martelly has big sacks of cash lying around in his house.” A valuable New York Times exposé last March has already confirmed that President Martelly’s close associates include drug smugglers, kidnappers, and killers. Why does the Obama administration continue to support such a regime? There are several theories here, and they are debated vigorously. The most charitable is that Martelly, a cunning musician-turned-politician, successfully manipulated US officials into believing that he had maintained his once-genuine popularity even after his stealing had prompted widespread revulsion. Another view is that Bill Clinton, who was known as “Le Gouverneur” during his failed effort to lead the relief effort after the 2010 earthquake, has personally benefited by diverting funds, and is a partner in crime with Martelly. Jean-Max Vincent, a small shopowner up in the coastal Arcahaie region, says he has seen food and other items clearly marked as “donations” on sale in local markets. “Some of us think Clinton got the money himself,” Vincent said. Still another view is that Washington will do anything to prevent the return to power of the Lavalas movement, once led by Jean-Bertrand Aristide, the former priest who was twice elected president. But the popular opposition here is larger than the two political parties that have inherited some of the Lavalas support. The man of the hour may turn out to be Jude Célestin, a moderate figure with questionable ties to business who supposedly finished second in the first round, with 25.27 percent of the vote. Both Martelly and the State Department pressed Célestin hard to participate in the second round, but in the end he refused to take part in what he called “a masquerade,” thus increasing his standing among ordinary Haitians. As the street protests increased, President Martelly only got more intransigent. He said the government would push toward the January 24 vote “tèt dwat,” an expression that translates as “head first,” but he had the condescending tone you might use with a child. Only after the protests got even more militant did the government concede, with just two days to spare. What’s next? The Haitian Constitution requires Martelly to leave office by February 7, although many thousands want him out before then. The opposition calls for a transitional government, which would reorganize the corrupt elections commission and start over with a new voting cycle, which could take anywhere from 6 months to 2 years. The State Department is still absorbing the shockwaves from its gigantic mistake, and must be worrying that Congress may start investigating the wasted $33 million. If democracy continues to be thwarted here, another word in common use these past months could become reality. Dechoukaj literally means “uprooting,” but in Haiti’s history actually stands for the vengeance that Haitian masses exacted after they chased dictator Jean-Claude (Baby Doc) Duvalier into exile in 1986. Enraged groups destroyed Duvalier’s properties and attacked and killed some of his functionaries. Today, once again, many Haitians are very angry. Unless a fair path toward a more genuine democracy is in place soon, Michel Martelly’s $9 million beachfront home could become one of many targets. James NorthTwitterJames North has reported from Africa, Latin America, and Asia for four decades. He lives in New York City.